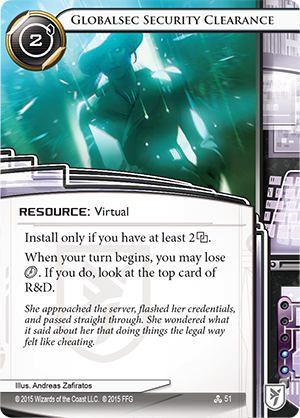 Data and Destiny, the fourth deluxe expansion for Android: Netrunner is scheduled to arrive at retailers soon! 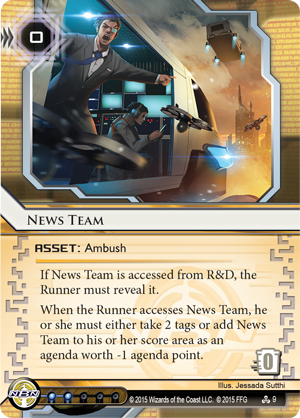 With its 165 new cards (three copies each of fifty-five different cards), Data and Destiny introduces three new "wild card" Runners and their mini-factions, Apex, Sunny Lebeau, and Adam. 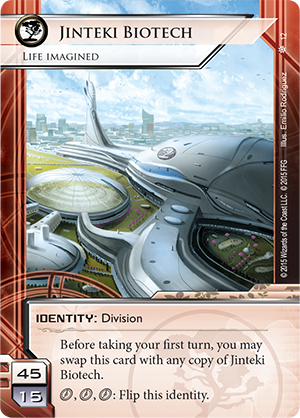 Over the course of our first three previews, we've looked at each of these Runners, in turn, and explored how they might use their influence, as well as how their new faction-specific cards might change the shape of the game. 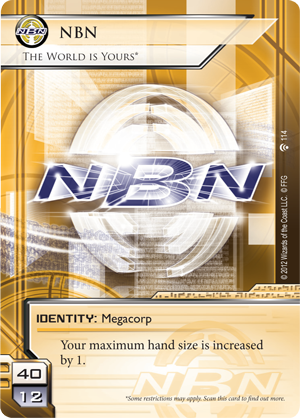 However, there's still another faction represented in Data and Destiny, and it gains as many new cards as all three Runners combined—media giant NBN, the megacorp whose fortunes are directly tied to the collection and transmission of data. 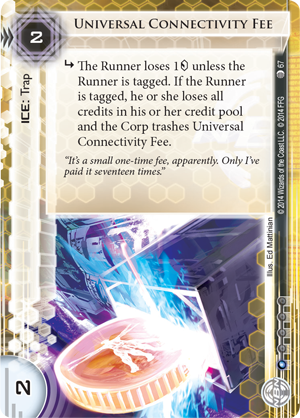 After all, Android: Netrunner is a game of futuristic, high-stakes cybercrime, in which Runners and Corps wage virtual battles on the Network in the hopes of controlling valuable data. Everyone has a different angle. Everyone has a different style. Yet, everyone, everywhere conducts their virtual battles on the Network. And who manages the Network's infrastructure? NBN. 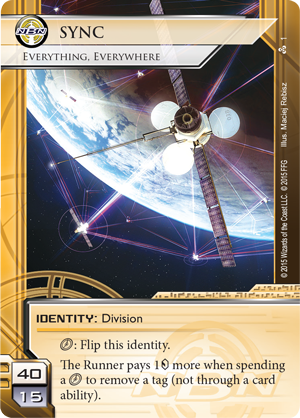 In today's preview, fiction editor Katrina Ostrander introduces one of the three new NBN identities appearing in Data and Destiny, SYNC (Data and Destiny, 1), and as we'll learn, the rise of SYNC is tied directly to the rise of the Network. The history of SYNC is inextricably bound to that of the Network, the sprawling web of interconnectivity that links you and your PAD to… everything. Everything in a city like New Angeles is connected. The city’s utility grid talks to its public transit system. Shops and businesses read and analyze people's shopping histories, health, and habits. Seccams and camdrones watch over New Angelinos, keeping them safe and reporting the news to NBN and the NAPD as it happens. Thanks to the Network, life has never been safer, easier, more efficient, or more convenient, and SYNC’s infrastructure makes it all possible. Indeed, NBN’s fortunes are tied directly to the rise of SYNC. Before the Blackout, Network Broadcast News was a small news and media organization based out of SanSan and one of the many child companies created after the breakup of the Vertex multimedia empire. When the Blackout swept across the continents, daily life ground to a screeching halt as the crucial data streams of the world's paperless societies faltered and disappeared. Authorities are still unsure whether the malicious cyber attack had been launched by terrorists, a rogue state, or another entity, but the effects were crippling regardless. Regional networks struggled to recover. Finally, NBN offered an answer. Engineers within NBN’s R&D division had been developing a new network protocol that turned out to be immune to the virus infecting computers and servers everywhere. Even after the Blackout, this protocol could securely and reliably transmit data from any kind of device to another. In their desperation to restore their constituents to a sense of normalcy, the governments that had originally broken up Vertex granted NBN a new monopoly to roll out their infrastructure across the world. This safer, friendlier network was simply dubbed "The Network," and it connected the globe even more closely than before. The subsidiary created to oversee and service the Network was named SYNC, and the revenues it generated allowed NBN to buy up its cousin companies and eventually expand to Luna and Mars. Thanks to SYNC and the rise of the Network, NBN became the undisputed master of information, and the Corp hurtled to a place among the Big Four. Now, SYNC’s protocols are integrated into virtually everything you buy and every place you visit. The food you purchase will relay its nutritional information to your PAD to help you keep track of your health. Your arcology apartments or office space will adjust lighting and temperature to keep you at peak comfort or productivity. The Skyway hoppers and Metro tube-lev trains will alert their riders of any delays the moment they happen. The shops you walk past will send their latest deals straight to your PAD, and you can see what’s popular among your FriendNet circles before deciding what to buy with your credaccount. SYNC is truly everything, everywhere, and nearly everyone relies on its Network to help them keep up and thrive in a complex and hyper-paced solar system. 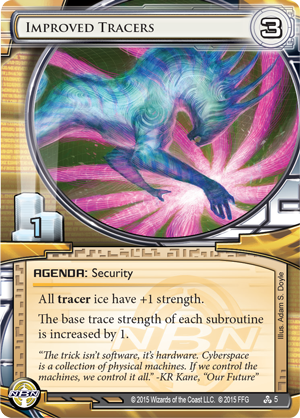 In Android: Netrunner, SYNC is all about the ties between the Network's data streams and the devices that connect to that data, which, again, include pretty much all the resources you could hope to find anywhere in the solar system. 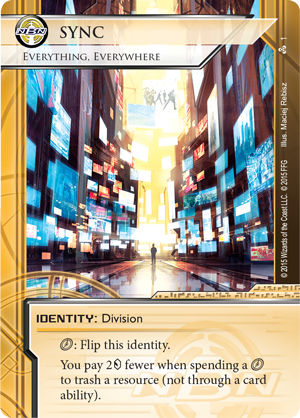 The identity card, meanwhile, arrives as the game's second "flip" identity, after the mechanic was already introduced with Jinteki Biotech (The Valley, 12). On its starting face, SYNC offers you the chance to run a tighter, slimmer, fully focused, forty-card deck with the standard fifteen influence. This is much like NBN: The World Is Yours* (Future Proof, 114), except that instead of increasing your maximum hand size by one, SYNC makes it harder for Runners to shake tags. 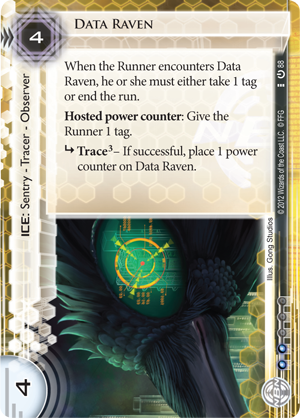 "The Runner pays 1 [credit] more when spending a [click] to remove a tag (not through a card ability)." The goal is clear: Tag the Runner, and keep him tagged. 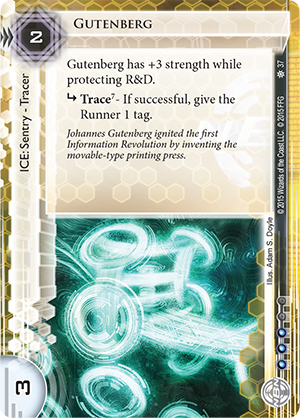 Accordingly, you'll want to include plenty of cards like Data Raven (Core Set, 88), SEA Source (Core Set, 86), Gutenberg (Breaker Bay, 37), and News Team (Data and Destiny, 9). 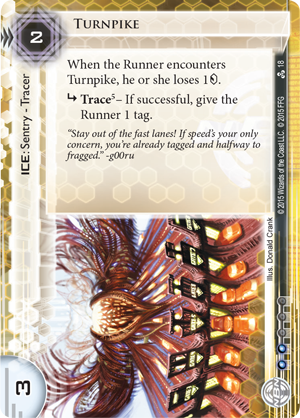 Anything that gives the Runner a tag is now a touch more effective as that tag is more likely to stick. 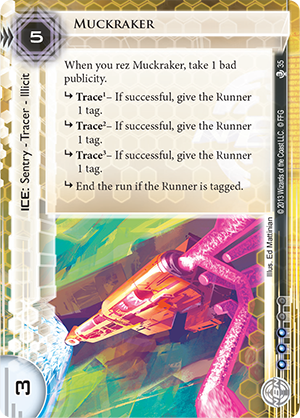 Anything that gives the Runner multiple tags, like Muckraker (Second Thoughts, 35) and Midseason Replacements (Future Proof, 116), becomes a far more taxing effect and far more likely to enable your future, tag-based efforts. To that end, then, SYNC can "flip" at the cost of one click, and its second side offers you tremendous power over all the different resources connected to the Network. 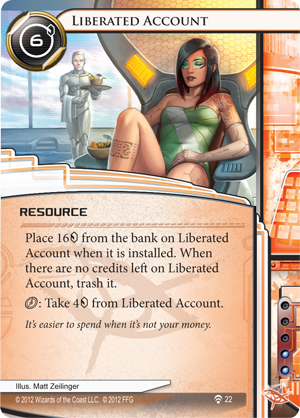 "You pay two [credits] fewer when spending a [click] to trash a resource (not through a card ability)." 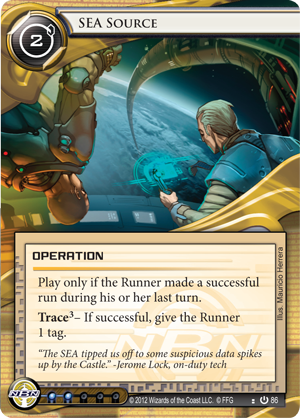 Every Corp in Android: Netrunner is able to trash a tagged Runner's resources. The ability is built into the game's basic actions. 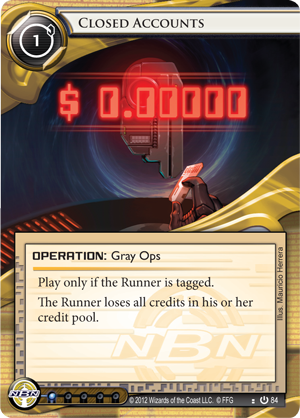 If the Runner is tagged, the Corp can spend one click and two credits to trash a resource. 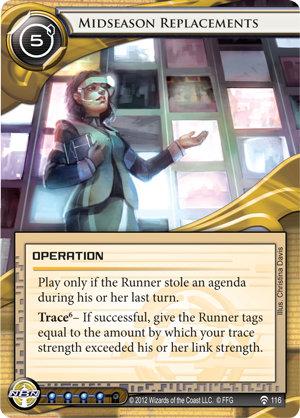 This gives the Corp powerful control over the Runner's economy should the Runner ever get tagged. 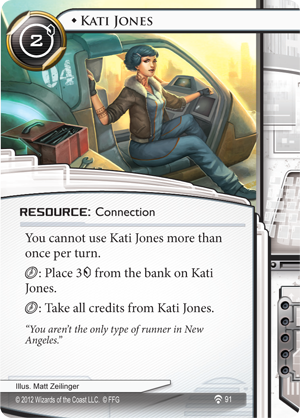 For one click and two credits, you can trash Professional Contacts (Creation and Control, 49), Kati Jones (Humanity's Shadow, 91), or a Liberated Account (Trace Amount, 22). By doing so, you negate the investment the Runner made into installing the resource and deny the Runner the benefits it would have offered. SYNC, however, literally created the protocols that bind materials and their data to the Network, and if the Runner gets tagged, no Corp or corporate division is more effective at exploiting all such connections. Is that Runner being supplied by Kati Jones? Maybe a couple of targeted ads pop up during her favorite sensie, carefully steering her away from that Runner's side. The web of connections interwoven between Runners, their resources, and their active devices is vulnerable at many points, and SYNC manages enough of those connections that it's more than capable of causing serious disruptions when it deems them necessary. 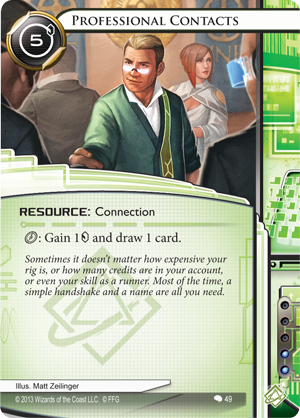 After all, while it's often easiest to think about your deck's economic efficiencies in terms of your ability to generate credits, the truth is that your ultimate efficiency is determined in relation to the Runner's. If you can wipe out the Runner's economy, yours becomes more profitable by comparison. 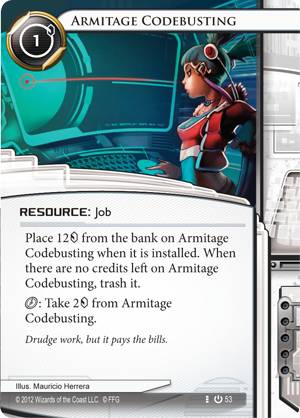 In other words, it might not pay to spend a click and two credits to trash an Armitage Codebusting (Core Set, 53) with just two credits on it, but for one click? Sure, your one click denies the Runner an extremely efficient expenditure of one click for two credits. Likewise, since there's no immediate economic benefit to you, you may think twice to pay the standard cost to trash a resource like Globalsec Security Clearance (Data and Destiny, 51), but for just one click? Trashing the resource suddenly becomes a click worth as much as the Runner invested in drawing and installing that resource. 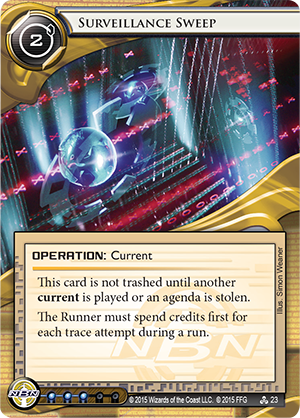 In other words, once it gets into a position of strength, SYNC excels at staying ahead, and as NBN you can always use cards like Closed Accounts (Core Set, 84), Turnpike (Data and Destiny, 18), and Universal Connectivity Fee (Up and Over, 67) to get into that position of strength. 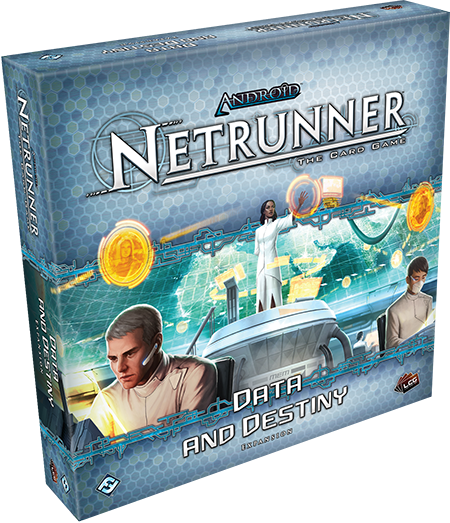 Whether you play as SYNC, another of the new NBN identities, or one of the expansion's new Runners, Data and Destiny provides you plenty of new tools to control your data and your destiny. How will you use them? The time is nearly here. Data and Destiny is scheduled to arrive at retailers soon!